Trips run from New Castle, NH just seconds from the action on Little Harbor, the Piscataqua River, and the Atlantic Ocean. Fly casting, spin fishing, lures and live bait. We do it all. Experience the Finest Charter Light Tackle and Fly Fishing in Portsmouth Harbor and along the New Hampshire and Maine Coast. 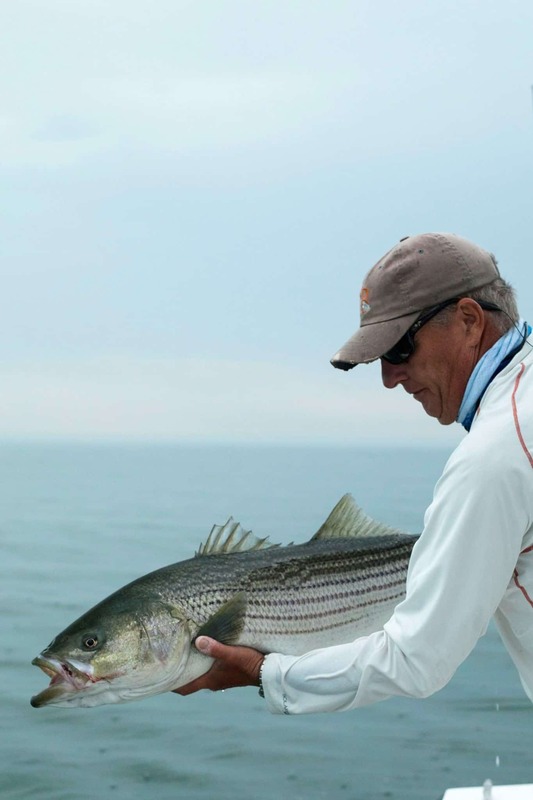 With Captain Peter Whelan at the helm, you can catch Striped Bass, Bluefish and Bluefin Tuna on a boat that is perfectly suited for this rugged and scenic New England Coastline. With over fifteen years of experience in these very waters, the big bass can’t hide from me, I’m on the water every day and have the fishery dialed in. Shoals Fly Fishing also caters to non fly-fishermen, families, and beginners. We offer guided light tackle and live bait fishing opportunities for Striped Bass, Bluefish, and Tuna in the nearshore waters off the coast of Maine and New Hampshire. Captain Whelan is a Portsmouth New Hampshire Original and the Seacoast’s Premier Fly Fishing and Light Tackle Charter Fishing Boat – as he has been for the past 15+ years. When experience matters, choose a Captain that knows the water, the fish, and the fishery – inside and out. The New England coastline and estuary supports a wide range of species including Striped Bass, Bluefish, Mackerel and the highly sought after schoolie Bluefin Tuna. There are many miles of tidal rips, shallows, beaches, sandy flats and rocky coastlines which provide many angling opportunities for light tackle fishing. I fish the historic coastline home to many lighthouses, colonial forts, and scenic 18th-century homes including the picturesque Nubble Lighthouse, a well-known hideout for striped bass. We fish aboard the Miss Jodine a 23 foot Mako customized for fly and light tackle angling with a four-stroke 225HP Yamaha outboard. 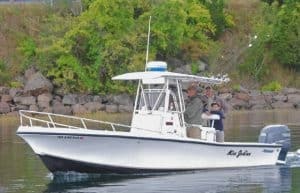 I have the ability to fish the shallow inshore areas along with offshore areas with this versatile yet comfortable boat. Fair warning, the boat is typically booked during New England’s short and sweet prime fishing season, so advanced reservations are highly recommended. While we do our best to respond in a timely fashion to inquiries, when we are on the water – we are fishing. And when we’re fishing, we fish hard, seven days a week. Shoals headquarters and home base. Easy access to the water from this beautiful marina.